The Nagaland Gaon Burhas Federation (NGBF), supported by tribal hohos and civil society organisations, has called for a 12-hour Nagaland bandh on February 11 against the Citizenship Bill. The federation took the decision at a meeting with tribal hohos and civil society groups here on Thursday. The meeting entrusted all apex tribal organisations to impose the bandh in their districts. Extending its support, the Central Nagaland Students’ Association on Friday urged its units to enforce the bandh. Association’s president Himato Yeputho said the association fully supports and endorses the initiative taken by the NGBF to oppose the Citizenship Bill and for early settlement of the Naga political issue. 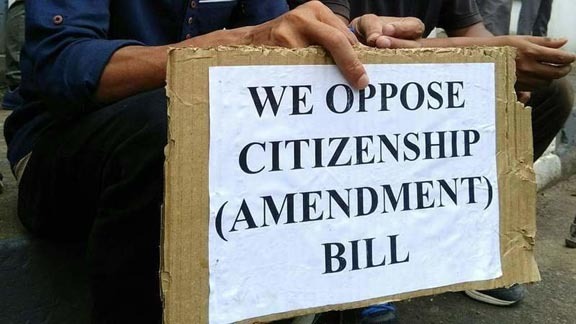 In another development, the NGBF, along with civil society organisations and public, held a protest march from Old MLA junction in Kohima to Raj Bhavan on Friday in protest against the Citizenship (Amendment) Bill, 2016 and demanding early settlement of the Naga issue. The federation submitted a memorandum to President Ram Nath Kovind to withhold his assent if the Citizenship Bill is passed by the Rajya Sabha through Governor P.B. Acharya. It also submitted a memorandum to Prime Minister Narendra Modi appealing for early solution to Naga political issue as promised by him. The federation also resolved that all Naga people would observe prayer day on Sunday in all churches in Nagaland on the two issues. It has entrusted Joint Christian Forum, pastors and tribal leaders to make necessary announcements. On the other hand, the Eastern Nagaland People’s Organisation (ENPO) urged the Nagaland government to convene a special Assembly session “before it is too late” to review and pass an Assembly resolution “as per the provision under Article 371(A) of the Indian Constitution” opposing the controversial Citizenship (Amendment) Bill “in order to avoid any adverse repercussion upon its people in the near future”. The organisation, in a letter President Ram Nath Kovind which was made available to the media on Friday, urged him to take into account the desire and wishes of the people against the bill. The six tribes under ENPO – Chang, Khiamniungan, Konyak, Phom, Sangtam and Yimchunger – resolved to totally oppose bill, the letter said. “The customary practices of the Nagas as enshrined in Article 371(A) of the Indian Constitution did not give citizenship to anybody basing on any religion,” the ENPO said. It demanded that the Centre take cognizance of of the voices of the people. The letter asserted that the ENPO would oppose the Bill “tooth and nail” to uphold the legitimate rights of the Nagas.